Diocletian’s Tetrarchy worked pretty well for about 20 years, but then it broke down. In 306 AD one of the four Emperors, Constantius, died. He was supposed to be succeeded by his assistant, Severus. But Constantius had a son, whose name was Constantine. When Constantius died, Constantine was not happy about being left out, and Constantius’ army declared Constantine emperor. There was a big civil war. In one of the battles of this civil war, in 312 AD, Constantine was about to fight the son of another Emperor, Maximian. This son was named Maxentius. The battle was right outside Rome: Constantine was camped outside the walls of Rome, and Maxentius was inside Rome. Constantine’s men were badly outnumbered. The night before the battle, Constantine claimed to have had a dream. A cross (or maybe some other Christian symbol) appeared in the sky and he heard the words, “Under this sign you will win.” (In Latin: In hoc signo vinces). Constantine figured that this meant he would win the battle if he had his soldiers paint a cross on their shields. 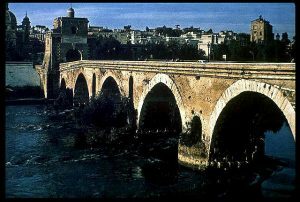 According to the story, Constantine did have the soldiers paint the cross on their shields, and they did win the Battle of the Milvian Bridge. Maxentius fell off the bridge and drowned. Constantine was very impressed with the power of the Christian god, and became a Christian. He put up a triumphal arch to remind people of his victory. By 324 AD Constantine killed off the last of the other Emperors, and ruled alone. In the same year he founded a new capital city in the East at Constantinople (modern Istanbul), to reflect the growing weakness of the Western part of the Roman Empire and the strength of the Eastern part. Constantinople means the city of Constantine. Constantinople was also halfway between the fighting against the Germans in the north and the fighting against the Sassanids in the East, making it easier for the Emperor to get where he needed to be. And maybe living there also made it easier to trade with the very rich Guptan Empire in India. The Roman Empire, by Don Nardo (1994). For middle schoolers and high schoolers – from Augustus to the fall of Rome. Diocletian and the Roman Recovery, by Stephen Williams (1985). Gives Diocletian more credit for the recovery than I would, but there aren’t any other biographies of Diocletian in English. Constantine, by Nancy Zinsser Walworth (1989). A biography for kids. Constantine and the Conversion of Europe, by A. H. M. Jones (1948, reprinted 1979). Still the best account of how Constantine came to convert to Christianity, and of his relationship with the Church throughout his reign. It’s not specifically for kids, but high schoolers could read it. The Life and Times of Constantine the Great: The First Christian Emperor, by D. G. Kousoulas (2nd edition 2003). A biography of Constantine. Julian the Apostate, by G. W. Bowersock (1978). A great biography, and lively reading too! Cite this page: Carr, K.E. 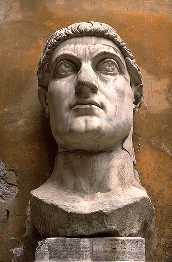 Constantine – Roman emperor – Later Roman Empire. Quatr.us Study Guides, September 3, 2017. Web. April 25, 2019.